Today, there are more ways than ever before to make a purchase and exchange currency. However, even with the advent of credit cards, debit cards and online banking, many of us are still relying on paper cheques. According to a 2009 national survey commissioned by INTERAC, and conducted by The Strategic Counsel, 75 per cent of Canadians are still using personal cheques. The study also notes that the greatest proportion of cheque users write approximately six to 20 cheques a year. While their popularity has declined over the years, consumers and business owners aren’t ready to bid farewell to this traditional method of transaction anytime soon. While many consumers use online banking to make transactions and keep track of their accounts, there is a high level of risk involved especially for those seniors who aren’t Internet savvy. Scammers frequently target the elderly more than any other demographic- this has many seniors hesitant to attempt online banking at all. Also, paper cheques enable seniors to stick to a budget an avoid being ripped off – if the cheque is lost or compromised, it’s easy to report and keep track of. There’s no doubt about it that credit cards continue to soar in popularity. From free swag and discounted trips to movie tickets, many credit card companies are pulling out all the stops to attract more users. Although they’re convenient, they can also be more of a hindrance than help for some. If not used with great diligence, careless spenders can quickly overspend and blow their budget – the result can have a devastating hit on one’s finances and credit score. With cheques, it’s impossible to spend more than one has in their account, nor is there interest to worry about. There are still companies out there today that require payment is made with a paper cheque, such as utility companies, mortgage companies, child care providers, etc. For anyone renting, paper cheques are often written in advance – this saves having to remember to make a payment on time and risk being penalized. While money continues to be a popular birthday and wedding gift, can you imagine stuffing a thick handful of crumpled bills in greeting card? It’s also just plain risky to gift cash at a party or even in the mail. Unfortunately, money cards go “missing” all-too-often at large parties and there’s no way to recoup that loss. Also, with mail theft on the rise, one should never send a card with money inside. When you lose cash, the chance of finding it or having it returned to its rightful owner is slim to none. If you’re not feeling up to gambling with your hard-earned-money, a paper cheque is your safest bet. 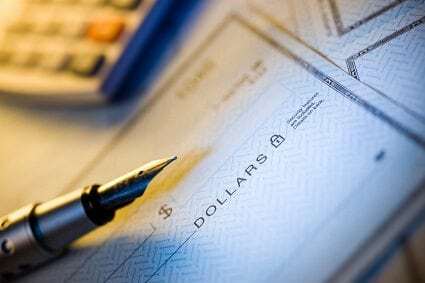 Writing a cheque sets up a paper trail –most banks keep a scan of each cheque on hand. This can be especially helpful in the event that a merchant claims they haven’t received payment. Yes- there’s the risk a thief could steal money from your account by forging a cheque, however “safety paper” makes it more difficult to do and easier to detect than ever before. There are numerous banks and credit unions that still offer unlimited cheque writing on all their checking account products. According to FindABetterBank, only 12 per cent of institutions offer a checking account product that limits how many paper cheques can be written per month. Let’s face it –it’s just so much easier to reach for your cheque book than head to the bank to take out cash. If you owe a friend hundreds of miles away $100, you can simply send them a cheque. Alternately, if you’ve exceeded your withdrawal limit at the ATM and someone turns up unexpectedly (plumber, washing machine repair guy, etc. ), you can give them a cheque. There’s also no worry about running out to the bank closest bank machine and paying sky-high transaction fees. And there you have it – seven reasons why paper cheques continue to thrive, even in the midst of a digital revolution. Happy paper trails to you!